Republican leaders have repeatedly cited support of (some) Catholic leaders in their opposition to the Obama Administration’s health care policies—particularly a requirement that insurance plans cover contraception, which the Church opposes on principle. But now Republicans are the ones catching grief from Catholic leaders, for violating a different set of Church teachings: about the need to protect the poor and vulnerable. On Tuesday, the U.S. Conference of Catholic Bishops sent a series of stern letters to Republican committee chairman in the House. The subject was proposed cuts to programs like food stamps and housing assistance, consistent with the overall spending blueprint that House Budget Chairman Paul Ryan has put forward. The message: Don’t slash the safety net, particularly if you’re doing so to finance tax cuts for the wealthy. The rebuke from the Bishops is welcome, if a bit overdue. Ryan has cited Catholic values as a justification for his proposals, saying that reducing government is consistent with Church teachings about self-reliance, local control, and allowing civil society to flourish. 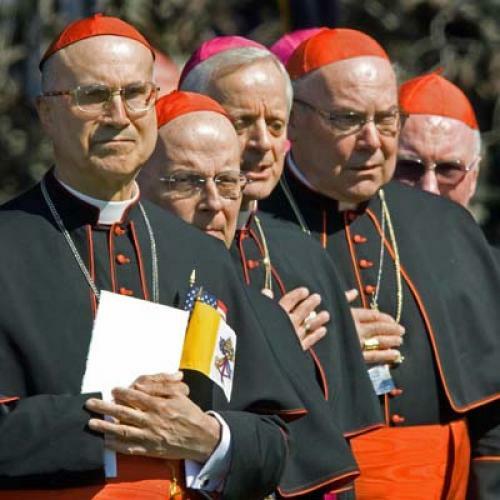 Those statements prompted an outcry from many Catholic leaders, who noted the Church’s longstanding defense of social welfare policies, but not from the Bishops, who have reserved most of their public criticism for policies on abortion and (lately) contraception. The Catholic Church has always been a powerful leader in the fight to protect the most vulnerable, and in past decades (especially the 1980’s) Catholic bishops were at the forefront of debates over economic issues. Just last year they lobbied behind the scenes and were leaders in the Circle of Protection which publicly spoke out against immoral budget priorities. But right now one of the most powerful Catholics in American politics is publicly claiming that church teaching says his plan to take food and health care away from millions of vulnerable Americans is the right thing to do—and the bishops are remaining silent. As Boehner surely knows, that’s not true. The only reasons the programs can’t survive under Republican budgets is that Republicans insist on using some of the money to finance tax cuts for the wealthy—and because Republicans keep opposing attempts to control health care spending by reforming the system itself, rather than simply reducing support for the sick and elderly. That’s precisely what the Bishops are saying when they call for “shared sacrifice.” Let’s hope the would-be budget cutters, or at least the voters who elect them, are listening.